- Gildan® Adult 5.3 Ounce Heavy Cotton Long Sleeve T-Shirt. 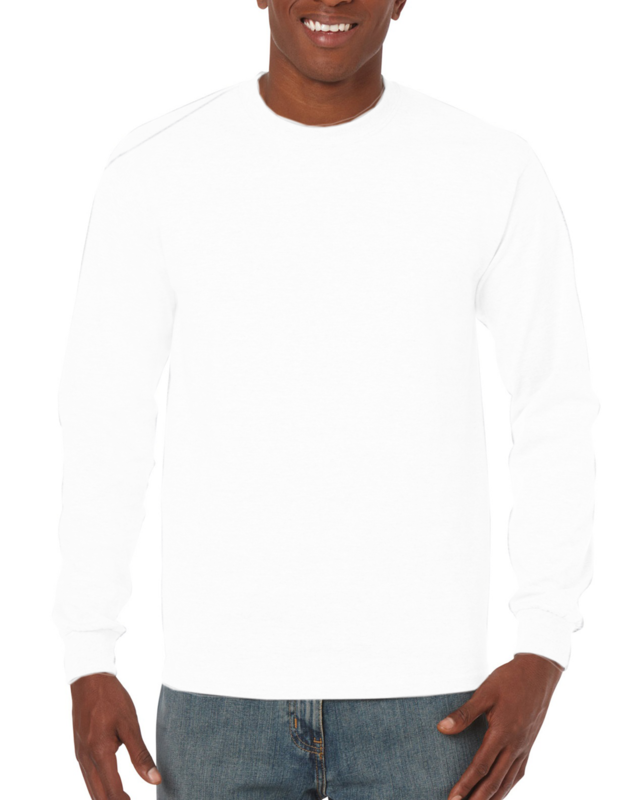 Gildan® Adult 5.3 Ounce Heavy Cotton Long Sleeve T-Shirt. 5.3 ounce, 100% cotton jersey. Double needle bottom hem and seamless double needle collar. Taped neck and shoulders. Ribbed cuffs and quarter-turned body. Tear away label. Sizes S-3XL: Neutral: White. Heathers: Ash Grey (99/1), Graphite Heather (50/50), Sport Grey (90/10). Colors: Black, Forest Green, Garnet, Gold, Irish Green, Maroon, Navy, Purple, Red, Royal, Safety Green (50/50)**, S. Orange (50/50). **ANSI/ISEA 107-2010 High Visibility certified for use as background material.